The new 2018 Honda Fit is the perfect combination of sporty and efficiency. Redesigned for 2018, the new Honda fit remains small in size but BIG in attitude. 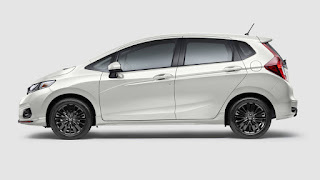 This aerodynamic, fuel efficient Honda features a stylish set of underbody spoilers, chrome exhaust tip, 16-inch black alloy wheels, and a leather wrapped shift knob. Take advantage of technology innovations and get alerted with this intelligent suite of safety tools. Come to the Olympia Auto Mall and see all the exciting colors, features, and performance packages that await you.